Page 4 of the same report makes clear that road traffic is forecast to be the major source of NOx (36%) and PM10 (65%) emissions in the LAEI area in 2010. This means that taxis are the most polluting sub-category of the most polluting emissions category in London. The consultation document states that only 62% of vehicles passed first time the taxi mid-year inspections in the first six months since their introduction in October 2007. Vehicles failed for a variety of reasons, primarily due to emissions test and vehicle suspension systems, with a wide variety of other causes. CCAL understands that 2,389 taxis failed pollution tests and 513 had brake problems in the past year. This means that taxis have been contributing unnecessarily to pollution levels in London. CCAL considers therefore that the proposal to abolish or weaken the current regime of taxi mid-year inspections cannot be justified on the basis of the facts or proposals presented by TfL. CCAL urges Mayor Johnson and the PCO instead to strengthen, rather than weaken, emission control measures for London’s Taxis and PHVs. The Mayor of London has a statutory duty to ‘work towards’ the Limit Values for particulate matter (PM10) and nitrogen dioxide (NO2). In CCAL’s view, Mayor Johnson would breach this statutory duty if taxi mid-year inspections were removed without fully, directly and robust offsetting measures being in full operation. CCAL notes that no such measures are currently proposed. CCAL considers that the following principles should be considered as a package as Mayor Johnson and the PCO consider how best to deliver a sharp reduction in harmful emissions from Taxis and PHVs. 1. Taxis and PHVs provide a vital service: Please take full account of the importance of the public service provided by Taxis and PHVs. 2. The polluter must pay: The polluter must pay the full environmental cost of his/her actions. In this case, the polluter is the user of the service i.e. the passenger. Please raise fares therefore to cover the cost of necessary action to reduce sharply harmful emissions from Taxis and PHVs. CCAL would support fare rises to compensate fully operators for the ‘opportunity cost’ of a Taxi or PHV being off the road for testing. 3. Euro IV or better: Taxis should be required to meet no less than Euro IV engine emissions standards for particulate matter and NOx by the earliest possible time. Euro IV engine emission standards are, in general, half as polluting as the current Euro III engine emission standards. CCAL encourages the government (copied) to offer massive incentives to accelerate the adoption, at least, of such standards by 2010. Low emission taxis would presumably exceed such standards. 4. PHVs must meet or exceed Taxi emission standards in the most polluted areas: All PHVs carrying fare paying passengers in the most polluted parts of London should be required at least to match the highest emissions standards applying to Taxis e.g. currently Euro III or better. This could be implemented through the use of colour- coded stickers with one colour allowing say London-wide access for PHVs and another prohibiting the most polluting PHVs from the most polluted parts of London. 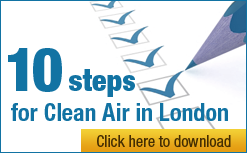 CCAL would support measures to ban older diesel-engined PHV’s from the most polluted parts of Central London. 5. Apply Taxi testing standards to PHVs: PHVs should be subject to mid-year, full year and spot check inspections in the same way that Taxis are. These should replace MOT only inspections. They should be set at the ‘higher emissions standards’ applicable to either. 6. Effective enforcement is essential: Effective enforcement must play an important part in regulating Taxis and PHV. In CCAL’s view, TfL’s facts show that taxi mid-year inspections are currently essential. If first time pass rates for taxi mid-year, full year and spot check inspections indicate in future that there is a very high level of day to day compliance with emission standards (say 90-95%), CCAL would support then a trial of reverting to annual inspections. 7. Systemic solutions: Such a low first time pass rate indicates that there is likely to be a systemic problem with compliance with emissions standards. What is the cause of this serious problem and what will be done about it and when? With Taxi and PHV drivers amongst the most exposed to harmful air pollution, the majority of them should welcome (at least in private) tighter emission standards paid for (rightly) by their passengers. A systemic problem must be addressed through systemic action. Strategy is put in place within weeks to succeed that which expired on 30 June 2008. In CCAL’s view it is essential that measures are included within this Strategy that take account fully of the need to comply with air quality laws. Such a Strategy should address fully all the principles outlined above. These responses must be considered in conjunction with the rest of this submission. In respect of the current, narrow, consultation Options, CCAL has the following responses. The positive and negative incentives proposed would not necessarily ensure that ‘vehicles are well maintained at all times’ as TfL suggests. Rather they may simply encourage unofficial checks immediately before formal testing! As TfL states, ‘vehicle age is not necessarily an indicator of the standard of maintenance or state of repair’. None of the above Options seems likely to achieve the third of the main aims of the consultation i.e. ‘To simplify arrangements and reduce the administrative burden on owners without compromising safety standards or reducing the overall condition of licensed vehicles throughout the annual licensing cycle’. CCAL considers that the consultation is biased towards removing mid-year inspections since all Options put forward would represent a weakening of the current regime and none would tighten the existing regime as seems needed. CCAL considers that TfL’s consultation is set too narrowly to consider just the need to ‘allow TfL to cover its costs and safeguard London’s travelling public’. What about the health of hundreds of thousands of Londoners who are exposed to levels of air pollution that are well in excess of the maximum levels recommended by the World Health Organisation? CCAL is concerned that Mayor Johnson does not seem to appreciate yet the scale and urgency of the action he needs to take if air quality laws are to be complied with in London. CCAL would be pleased therefore to meet Mayor Johnson and/or his advisers to discuss these proposals as proposed in his letter dated 31 July 2008.